Jimmy Reid’s funeral in 2010 was attended by Gordon Brown the former Prime Minister, Alex Salmond the First Minister and other leading politicians. Eulogies were given by his friends Sir Alex Ferguson and Billy Connolly. Crowds lined the streets for the funeral cortege. The Daily Telegraph described Reid as the ‘greatest MP Scotland never had’ in its obituary. Yet to date there has been no biography of the man who was an iconic figure in Scotland and hugely popular both as a politician and then as a TV and media commentator. Written with the approval and input of his family and friends it provides an insight into the man and his life. 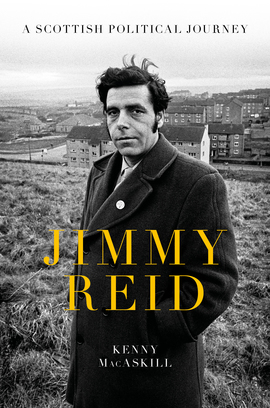 MacAskill’s biography describes Jimmy Reid’s rich and varied life from his upbringing in Govan, a senior full time official for the Communist Party of Great Britain, as well as his role in the Upper Clyde Shipbuilder’s work-in which ran for 16 months from June 1971 to October 1972. He was active in the trade union movement, and his political career took him from the CPGB to the Labour Party and eventually to the SNP and the cause of Scottish independence. The biography also covers his later career in the media as an acclaimed newspaper and magazine columnist and gifted television presenter. Underpinning the personal story is Scotland’s changing political landscape, transforming a land of council housing and manufacturing industry to owner occupied and financial services. Jimmy Reid was the great rallying figure for the Scottish left in the second half of the twentieth century. His leadership of the Clydeside workers was not just an industrial victory but brought about a fundamental change in the psychology of young Scotland. There was something irresistible in the prestige of his frame. Jimmy's journey from Communist agitator to independence advocate mirrors the transition of much of the Scottish left and his inspiring story is told with verve and insight by Kenny MacAskill. Jimmy lived his life with a sense of purpose. He was an inspirational figure whose regular, selfless acts improved so many lives, as this book shows. It was an honour to have him as a friend.